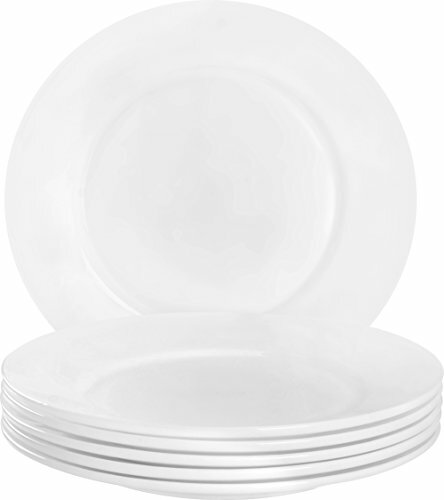 Utopia's 6 pieces of 6.75-inch dessert plates are elegantly designed with brilliance and a heat resistant opal glassware material so that the set does not lose its charm at any time. Its flat edge design further glorifies the set's appeal and makes it pleasing to the eye when in use. The set includes 6 pieces of 6.75-inch dessert plates which is ideal for a small family as it will cater to your dining needs with ease. It's a lightweight set which can easily be stacked when required, hence saving up a lot of storage space. These are microwave and oven safe, allowing you to easily heat up/prepare your meals while using these plates. Also, these are dishwasher safe so that you can get done with the cleaning process in no time.